The Tupolev Tu-22 (NATO reporting name Blinder) was a Soviet supersonic bomber and reconnaissance aircraft. The Tu-22 was originally intended as a supersonic replacement for the Tupolev Tu-16 bomber. Preliminary design of an aircraft to meet this requirement, designated Samolx�t 105 by Tupolev, was started in 1954, with the first prototype completed in December 1957, and making its maiden flight from Zhukovsky on 21 June 1958, flown by test pilot Yuri Alasheev. The availability of more powerful engines, and the TsAGI discovery of the Area rule for minimizing transonic drag, led to the construction of a revised prototype, the 105A. This first flew on 7 September 1959. The first serial-production Tu-22B bomber, built by Factory No. 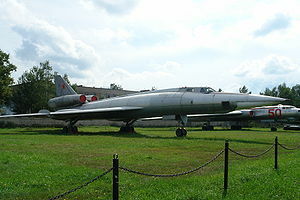 22 at Kazan, flew on 22 September 1960, and the type was presented to the public in the Tushino Aviation Day parade on 9 July 1961, with a flypast of 10 aircraft. It initially received the NATO reporting name 'Bullshot,' which was deemed to be inappropriate, then 'Beauty,' which was deemed to be too complimentary, and finally the 'Blinder.' Soviet crews called it "Shilo" (awl) because of its shape. The Tu-22 entered service in 1962, but it experienced considerable problems, leading to widespread unserviceability and a number of crashes. Amongst its many faults was a tendency for skin heating at supersonic speed, distorting the control rods and causing poor handling. The landing speed was 100 km/h (62 mph) higher than previous bombers and the Tu-22 had a tendency to pitch up and strike its tail on landing, though this problem was eventually resolved with the addition of electronic stabilization aids. Even after some of its teething problems had been resolved, the 'Blinder' was never easy to fly, and it was maintenance-intensive. Pilots for the first Tu-22 squadrons were selected from the ranks of "First Class" Tu-16 pilots, which made transition into the new aircraft difficult, as the Tu-16 had a co-pilot, and many of the "elite" Tu-16 pilots selected had become accustomed to allowing their co-pilots to handle all the flight operations of the Tu-16 except for take-off and landings. As a consequence, Tu-16 pilots transitioning to the single-pilot Tu-22 suddenly found themselves having to perform all the piloting tasks, and in a much more complicated cockpit. Many, if not most of these pilots were unable to complete their training for this reason. Eventually pilots began to be selected from the ranks of the Su-17 "Fitter" crews, and these pilots made the transition with less difficulty. By the time the Tu-22B (Blinder-A) entered service it was already clear that its operational usefulness was limited. Despite its speed, it was inferior to the Tu-16 in combat radius, weapon load, and serviceability. Soviet leader Nikita Khrushchev felt that ballistic missiles were the way of the future, and bombers like the Tu-22 were in danger of cancellation. As a result, only 15 (some sources say 20) Tu-22Bs were built. 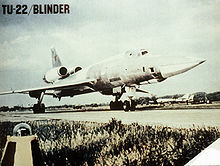 A combat-capable reconnaissance version, the Tu-22R ('Blinder-C'), was developed alongside the bomber, entering service in 1962. The Tu-22R could be fitted with aerial refueling probe that was subsequently fitted to most Tu-22s, expanding their radius of operation. 127 Tu-22Rs were built, 62 of which went to the AVMF for maritime reconnaissance use. Some of these aircraft were stripped of their camera and sensor packs and sold for export as Tu-22Bs, although in other respects they apparently remained more comparable to the Tu-22R than to the early-production Tu-22Bs. A trainer version of the 'Blinder,' the Tu-22U ('Blinder-D') was fielded at the same time, with a raised cockpit for an instructor pilot. The Tu-22U had no tail guns, and was not combat-capable. 46 were produced. To try to salvage some offensive combat role for the Tu-22 in the face of official hostility, the Tu-22 was developed as a missile carrier, the Tu-22K ('Blinder-B'), with the ability to carry a single Raduga Kh-22 (AS-4 'Kitchen') stand-off missile in a modified weapons bay. The Tu-22K was deployed both by DA (Strategic Aviation), and AVMF (Naval Aviation). The last Tu-22 subtype was the Tu-22P ('Blinder-E') electronic warfare version, initially used for ELINT electronic intelligence gathering. Some were converted to serve as stand-off ECM jammers to support Tu-22K missile carriers. One squadron was usually allocated to each Tu-22 regiment. The Tu-22 was upgraded in service with more powerful engines, in-flight refueling (for those aircraft that did not initially have it), and better electronics. The -D suffix (for Dalni, long-range) denotes aircraft fitted for aerial refueling. Tu-22s were exported to Iraq and Libya in the 1970s. An Egyptian request was turned down after the cooling of Soviet-Egyptian relations in the wake of the Yom Kippur War. The Tu-22 has a low-mid mounted wing swept at an angle of 55�. The two large turbojet engines, originally 159 kN (35,273 lbf) Dobrinin VD-7M, later 162 kN (36,375 lbf) Kolesov RD-7M2, are mounted atop the rear fuselage on either side of the large vertical fin, with a low mounted tailplane. Continuing a Tupolev OKB design feature, the main landing gear are mounted in pods at the trailing edge of each wing. The highly swept wings gave low drag at transonic speeds, but led to very high landing speeds and a long take-off run. The Tu-22's cockpit placed the pilot forward, offset slightly to the left, with the weapons officer behind and the navigator below, within the fuselage, sitting on downwards firing ejector seats. The cockpit design had very poor visibility (doing nothing for the Tu-22's poor runway performance), uncomfortable seats and poor location of instruments and switches. The Tu-22's defensive armament, operated by the weapons officer, consisted of a tail turret beneath the engine pods, containing two 23 mm AM-23 or R-23 cannon. The turret was directed by a small PRS-3A 'Argon' gun-laying radar to compensate for the weapons officer's lack of rear visibility. The bomber's main weapon load was carried in a fuselage bomb bay between the wings, capable of carrying up to 24 FAB-500 general-purpose bombs, one FAB-9000 bomb, or various free-fall nuclear weapons. On the Tu-22K, the bay was reconfigured to carry one Raduga Kh-22 (AS-4 'Kitchen') missile semi-recessed beneath the fuselage. The enormous weapon was big enough to have a substantial effect on handling and performance, and was also a safety hazard. The early Tu-22B had an optical bombing system (which was retained by the Tu-22R), with a Rubin-1A nav/attack radar. The Tu-22K had the Leninets PN (NATO reporting name 'Down Beat') to guide the Kh-22 missile. The Tu-22R could carry a camera array or an APP-22 jammer pack in the bomb bay as an alternative to bombs. Some Tu-22Rs were fitted with the Kub ELINT system, and later with an under-fuselage palette for M-202 Shompol side-looking airborne radar, as well as cameras and an infrared line-scanner. A small number of Tu-22K were modified to Tu-22KP or Tu-22KPD configuration with Kurs-N equipment to detect enemy radar systems and give compatibility with the Kh-22P anti-radiation missile. The Libyan Arab Republic Air Force (LARAF) used the Tu-22 in combat against Tanzania in 1979 as part of the Uganda-Tanzania War to help its Ugandan allies, with a single Tu-22 flying a completely unsuccessful bombing mission against the town of Mwanza on 29 March 1979. The Libyan aircraft were also used against Chad as part of the Chadian-Libyan conflict, with strikes into western Sudan and Chad. Libyan Tu-22s flew their first mission over Chad on 9 October 1980 against Hissx�ne Habr�'s forces near the Chadian capital of N'Djamena. 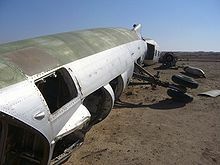 Occasional bombing raids by small numbers of Tu-22s against targets in Chad and Sudan, including a raid on Omdurman in September 1981 which killed three civilians and injured a further 20, continued to be carried out until a ceasefire was arranged in November 1981. Fighting restarted in July 1983, with Libyan air power, including its Tu-22s, being used in attacks against forces loyal to Habr�, before a further ceasefire stopped the fighting until Libyan backed forced launched a fresh offensive in early 1986. On 17 February 1986, in retaliation for the French Operation x�pervier (which had hit the runway of the Libyan Ouadi Doum Airbase one day earlier), a single LARAF Tu-22B attacked the airfield at N'Djamena. Staying under French radar coverage by flying low over the desert for more than 1,127 km (700 mi), it accelerated to over Mach 1, climbed to 5,030 m (16,503 ft) and dropped three heavy bombs. Despite the considerable speed and height, the attack was extremely precise: two bombs hit the runway, one demolished the taxiway, and the airfield remained closed for several hours as a consequence. One bomber was shot down by captured 2K12 Kub (SA-6) surface-to-air missiles during a bombing attack on an abandoned Libyan base at Aouzou on 8 August 1987. One eyewitness report suggests that the pilot ejected but his parachute was seen on fire. Another Blinder was lost on the morning of 7 September 1987, when two Tu-22Bs conducted a strike against N'Djamena. This time, French air defenses were ready and a battery of MIM-23 Hawk SAMs of the 402nd Air Defence Regiment shot down one of the bombers, killing the East German crew. This raid was the last involvement of the Tupolev Tu-22 in the Libyan-Chadian conflict. Libyan aircraft are probably now unserviceable because of a lack of spare parts, although seven are visible at the Al Jufra Air Base at the following coordinates: 29�11′58.18″N 16�00′26.17″E﻿ / ﻿29.1994944�N 16.0072694�E﻿ / 29.1994944; 16.0072694. Iraq used its Tu-22s in the Iran-Iraq War from 1980-1988, losing about seven of its twelve aircraft in combat, including one shot down by an Iranian SAM over Tehran, and a second shot down by an Iranian Grumman F-14 Tomcat. Two were destroyed at an Iraqi base due to undeclared reason in the mid '80s, and one was destroyed at H3 base in October 1980 during a faulty landing (all crew and some others were killed). Iraq moved some of its Tu-22s to Yemen for a few days and the aircraft returned to Iraq during October 1980. Iraq evacuated its Tu-22s to western base H3 in the early days of the war. All of the Iraqi aircraft that survived the Iran-Iraq War were destroyed on the ground in the 1991 Gulf War. The only Soviet combat use of the Tu-22 took place in 1988, during the Soviet war in Afghanistan. Radar-jamming Tu-22PD aircraft covered Tu-22M bombers operating in Afghanistan near the Pakistan border, protecting the strike aircraft against Pakistani air defense activity. The Tu-22 was gradually phased out of Soviet service in favor of the more-capable Tupolev Tu-22M. At the time of the collapse of the Soviet Union there were 154 remaining in service, but none are now believed to be flying. More than 70 were lost in various operational accidents. A total of 311 Tu-22s of all variants were produced, the last in 1969. Production numbers were following: 15 of bomber version (B), about 127 of reconnaissance versions (R, RD, RK, RDK and RDM), 47 of ELINT versions (P and PD), 76 of missile carriers (K, KD, KP and KPD) and 46 of training versions (U and UD). Original free-fall bomber variant. Only 15 built, ultimately used mostly for training or test purposes. Reconnaissance aircraft, retaining bombing capability. Version of Tu-22R with refueling equipment. Reconnaissance aircraft, retaining bombing capability and fitted with Kub ELINT systems in the 1970s. Version of Tu-22RK with refueling equipment. Upgraded reconnaissance version, converted from earlier RD aircraft in the early 1980s, with instruments in a detachable container. Version of Tu-22P with refueling equipment. Missile-carrier version built from 1965, equipped to launch the Raduga Kh-22 (AS-4 Kitchen) missile. Version of Tu-22K with refueling equipment. Electronic warfare / bomber version, introduced circa 1968, carrying the Kh-22P anti-radiation missile. Version of Tu-22KP with refueling equipment. Tu-22UD Version of Tu-22D with refueling equipment. Picture - Former operators of the Tu-22 "Blinder"
Libyan Air Force-Retired due to lack of spare parts. Iraqi Air Force- received 12 aircraft. All destroyed or scrapped during the Iran-Iraq War and Gulf war. Russian Naval Aviation - retired during the 1990s. All Soviet Union Tu-22 aircraft were passed to successor states: Russia and Ukraine. Burdin, Sergey "TUPOLEV TU-22 BLINDER: Supersonic Bomber, Attack, Maritime Patrol and Electronic Countermeasures Aircraft" (ISBN 978-1844152414). Cooper, Tom, Farzad Bishop and Arthur Hubers. "Bombed by 'Blinders': Tupolev Tu-22s in Action - Part One". Air Enthusiast, No. 116, March/April 1995. Stamford, UK:Key Publishing. pp. 56-66. ISSN 0143 5450.
Cooper, Tom, Farzad Bishop and Arthur Hubers. "Bombed by 'Blinders': Tupolev Tu-22s in Action - Part Two". Air Enthusiast, No. 117, May/June 1995. Stamford, UK:Key Publishing. pp. 46-57. ISSN 0143 5450. Duffy, Paul and Andrei Kandalov. Tupolev The Man and His Aircraft. Shrewsbury, UK:Airlife Publishing, 1996. ISBN 1 85310 728 X.
Gunston, Bill. "Russian Revelations: New Aircraft Seen at Tushino on July 9". Flight, 27 July 1961, pp. 109-112. Williams, Anthony G. and Emmanuel Gustin. Flying Guns: The Modern Era. Ramsbury, UK:The Crowood Press, 2004. ISBN 1 86126 655 3. Zaloga, Steven J. "Tupolev Tu-22 'Blinder' and Tu-22M Backfire". World Air Power Journal, Volume 33 Summer 1998. London:Aerospace Publishing, 1998. pp. 56-103. ISBN 1 86184 015 2. ISSN 0959-7050.